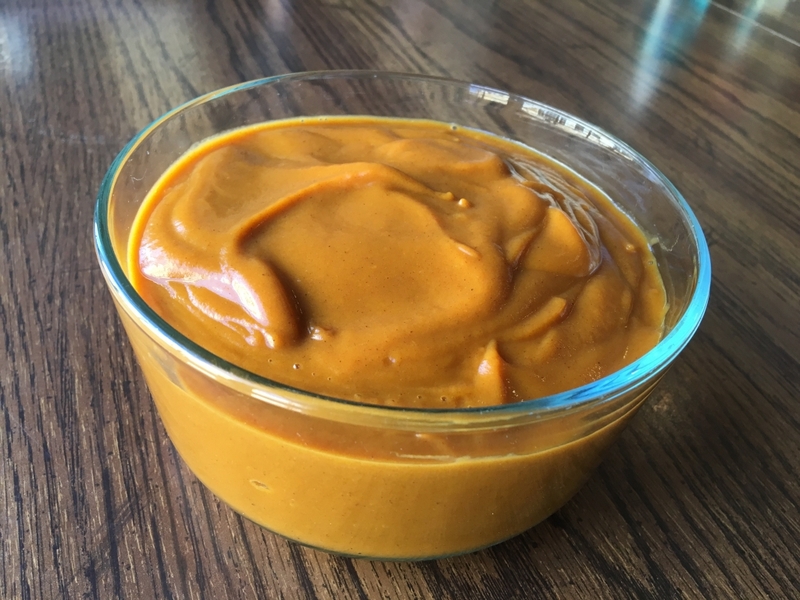 In an 8-ounce (half-pint) jar with a lid, combine honey, coconut oil, turmeric powder, and black pepper and stir vigorously. Mix ingredients until well blended and smooth. Cover with lid and keep at room temperature. 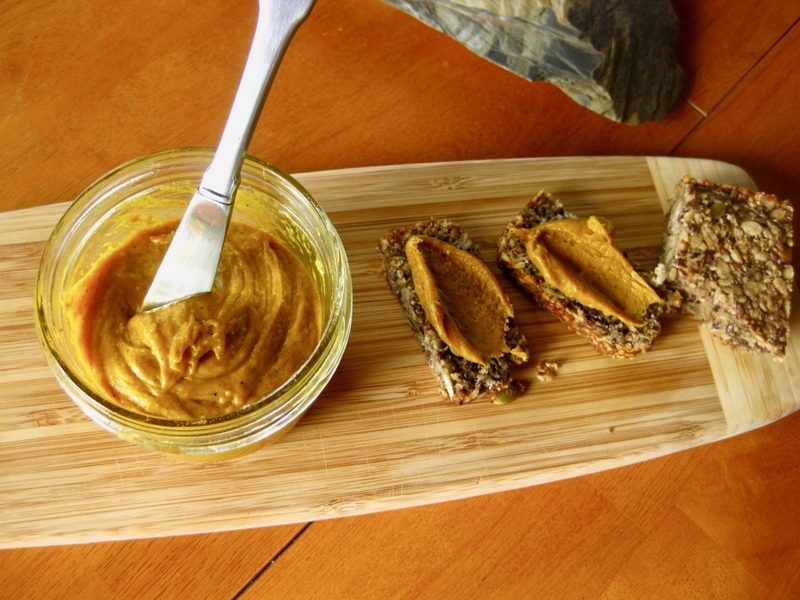 Can be used as a spread on crackers, bread, carrots, or apples. Another alternative is to dissolve 2 t. in one cup of hot water to make a tea. This recipe could also be made with an immersion blender or in a blender if preferred. *Gold Label Coconut Oil will give you a robust punch of a coconut flavor, whereas Pure Coconut Oil will be tasteless. Choose and enjoy! Karen Kusener from Quincy, California won $50 for this recipe and photo! Submit your recipes and photos here! Line a muffin tin with baking cups. Mix coconut flour, chia seeds, cinnamon, baking powder, baking soda, salt, and collagen powder together in a bowl. Mash bananas thoroughly and beat together with eggs, honey,vanilla and coconut oil*. Combine wet and dry ingredients and divide evenly among baking cups. Bake for approximately 16-20 minutes, until they look set and a toothpick comes out clean. Allow to cool slightly and serve warm with grass fed butter. Keep well in an airtight container in the fridge, or freeze extras for later. *Make sure your ingredients are room tempurature, add your coconut oil last, and combine well to avoid having your coconut oil solidifying. **Gold Label Coconut Oil will give you a robust punch of a coconut flavor, whereas Pure Coconut Oil will be tasteless. Choose and enjoy! Lydia Bryant from Salem, Virginia won $50 for this recipe and photo! Submit your recipes and photos here! Put the collagen and gelatin into a small saucepan. Add the water, then wait for the collagen and gelatin to bloom. In the meantime, add the sweet potatoes, salt, sweetener of choice, cinnamon, cardamom, pumpkin pie spice, vanilla, and clove to your food processor and blend until combined. Heat the gelatin, collagen, and water mixture, and stir until the gelatin is completely dissolved. Next, add the water, coconut milk, and coconut oil to the saucepan and continue heating and stirring until everything is melted and combined. Turn on your food processor, and slowly add saucepan contents to the other ingredients and blend until completely smooth. Transfer to a glass baking dish and refrigerate. 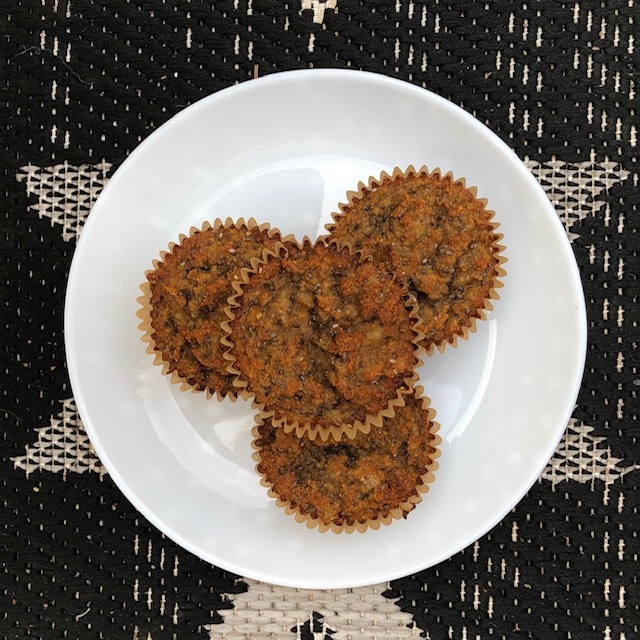 *To make this recipe refined sugar-free and/or Keto friendly use the Stevia powder listed above. Find our homemade coconut milk recipe here. **Gold Label Coconut Oil will give you a robust punch of a coconut flavor, whereas Pure Coconut Oil will be tasteless. Choose and enjoy! Heat oils in a large saucepan over medium heat. Add onion, garlic, sauté until onions are soft. Add beef, sauté until beef is mostly cooked but still pink. Add seasoning and tomato sauce. Simmer over low heat for 30-60 minutes. Cook noodles according to package instructions. 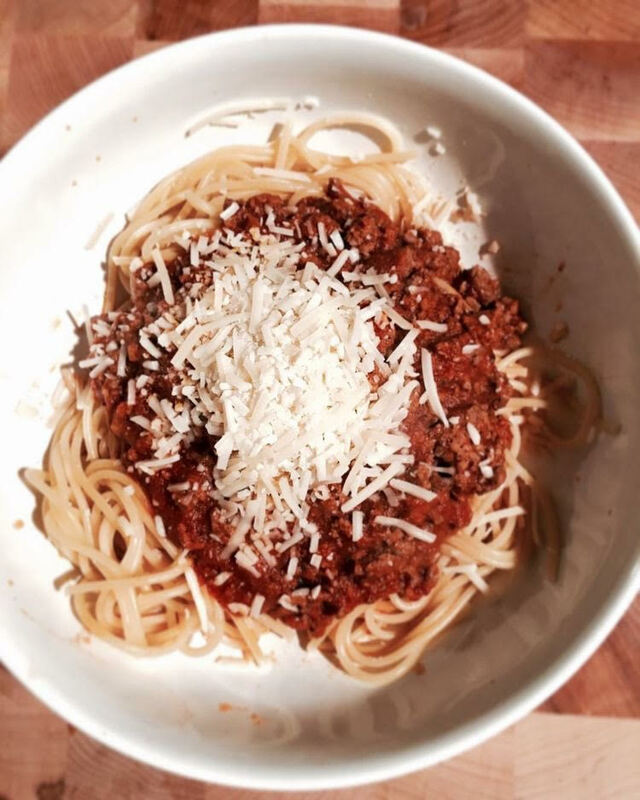 Serve noodles with a giant spoonful of meat sauce and a generous helping of parmesan! To make this recipe gluten-free and/or dairy-free, use your favorite GF pasta, and omit or use your favorite dairy-free cheese. *Gold Label Coconut Oil will give you a robust punch of a coconut flavor, whereas Pure Coconut Oil will be tasteless. Choose and enjoy! Melt coconut oil on the stovetop over medium heat. Add peanut butter, chocolate, and salt. Remove from heat and add remaining ingredients. Mix well. 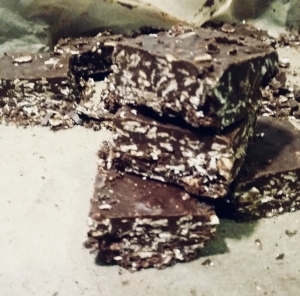 Pour into a 9×13 glass pan and spread into bars. Chill in refrigerator until cold – about 10 minutes. Myra Turmenne from Lewiston, ME won $50 for this recipe and photo! Submit your recipes and photos here! Line an 8 x 8 x 2-inch square baking pan with waxed or parchment paper; lightly grease with coconut oil or butter. Heat together peanut butter and butter in medium-size saucepan over low heat until melted. Stir in honey, water and vanilla. Remove from heat. Gradually stir in powdered cane sugar and powdered milk until blended. Knead with hands if necessary. Turn into prepared pan; pat out firmly to evenly cover bottom of pan. Let cool, then score top with a fork. Heat cream in small saucepan over low heat just until tiny bubbles appear around edge of pan. Remove from heat. Add chocolate chips; let stand for about 30 seconds. Stir until smooth. Pour chocolate over peanut butter layer, spreading to cover completely. Refrigerate until firm, at least 1 hour. Stir together powdered cane sugar, melted butter, coconut milk and water (if needed) in a small bowl. For best results, use an offset spatula to carefully spread glaze over top of chocolate layer. Sprinkle evenly with chopped peanuts, if desired. Refrigerate about 2 hours or until firm enough to cut. Lift fudge out of pan and carefully remove waxed paper. Cut into 64 small pieces. Small truffle cups or mini cupcake liners work well for gift giving, if desired. Place one piece of fudge into each liner and wrap in plastic wrap. Sheri from Avon, IN won $50 for this recipe and photo! Submit your recipes and photos here! Halve and remove the seeds from squash, then cut into bite-size pieces (do not peel the squash). 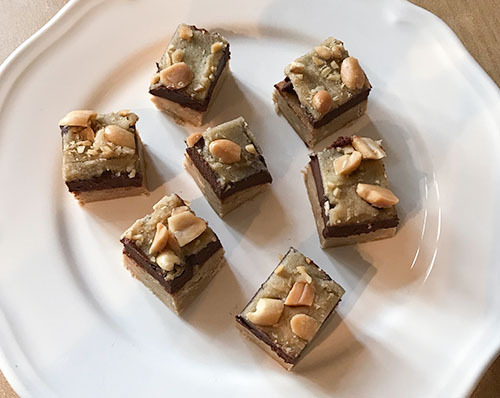 Spread pieces in a single layer on a baking sheet lined with parchment paper. Roast for 30 minutes, or until squash is tender but not fully cooked. Place the squash in a bowl and set aside. Heat the coconut oil in a Dutch oven or soup pot over medium heat. Sauté diced onion, garlic, carrots, and celery for 7 minutes, or until the vegetables begin to soften. Add the broth, water, beef, and reserved squash. Rub thyme between fingers and add it, along with the sage, salt, pepper, and barley to the pot. Stir well to combine. Bring soup to a boil, then lower heat to a simmer. Cover and cook for 30-45 minutes, or until the barley and vegetables are cooked through. Turn off the heat and add parsley, stirring well. 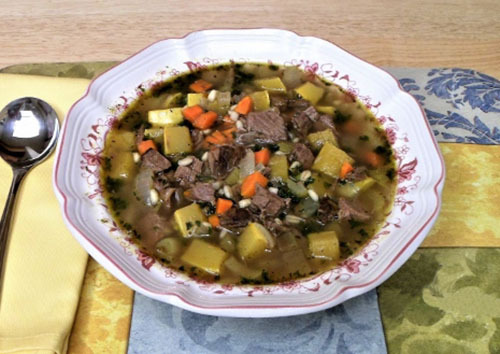 Let parsley blend in the soup for a few minutes, then serve. Stephanie from Rio Rancho, NM won $50 for this recipe and photo! Submit your recipes and photos here! Mix all ingredients together in a medium mixing bowl. 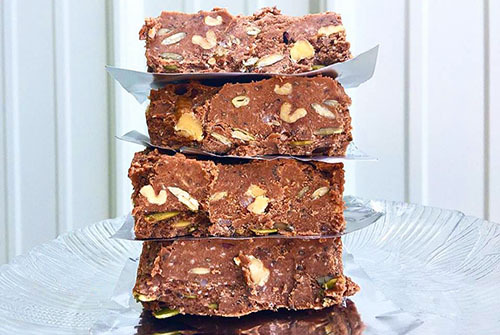 Pour into a 9×12 glass pan and allow to set up overnight in the fridge before cutting into bars and serving. Keep in the fridge until ready to eat. They melt fast! Orissa from Columbia, KY won $50 for this recipe and photo! Submit your recipes and photos here!